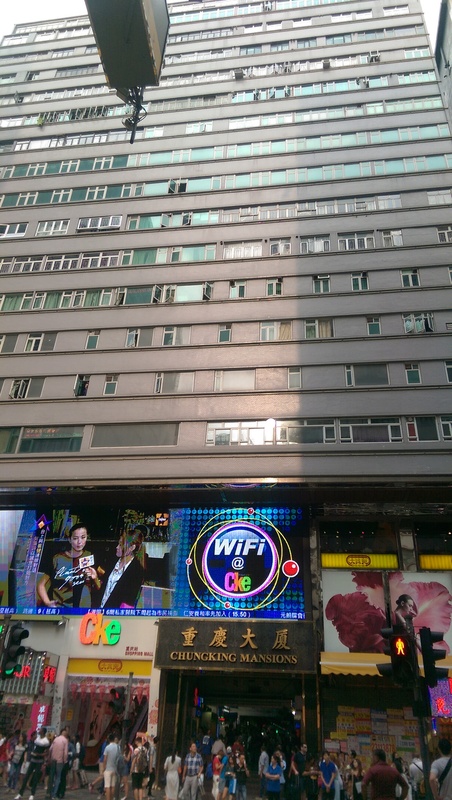 I hope you don’t mind, but over the next couple of entries I would like to share with you my “How to Hong Kong” guide. 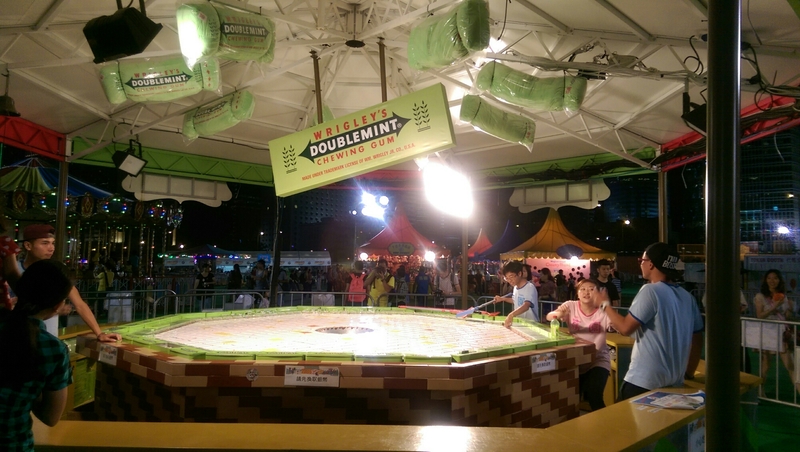 Yes, I am expressing extreme and controversial creative license by conjugating Hong Kong into a verb, but I believe in order to make the most of Hong Kong there are some things you have to do. I say this with a certain air of authority because I did all the things. 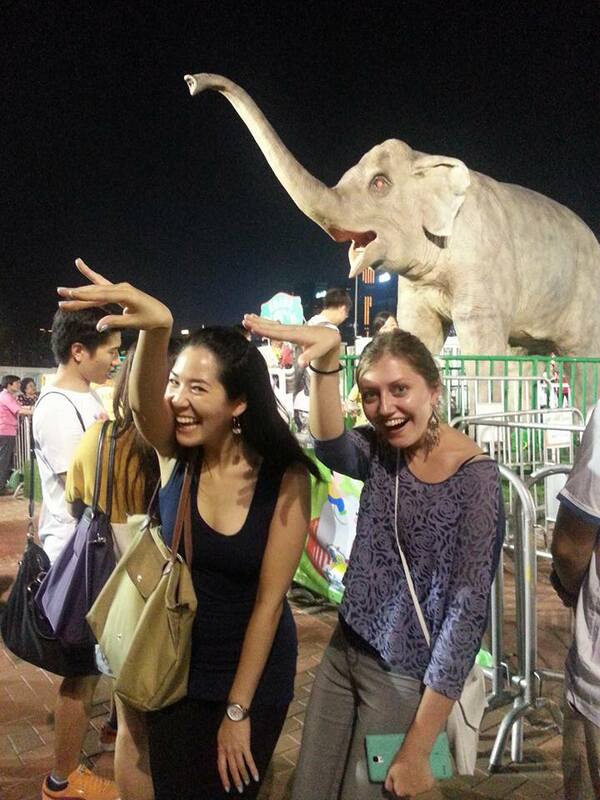 And you would too, if you also set off on a 5 days 6 nights trip to Hong Kong. 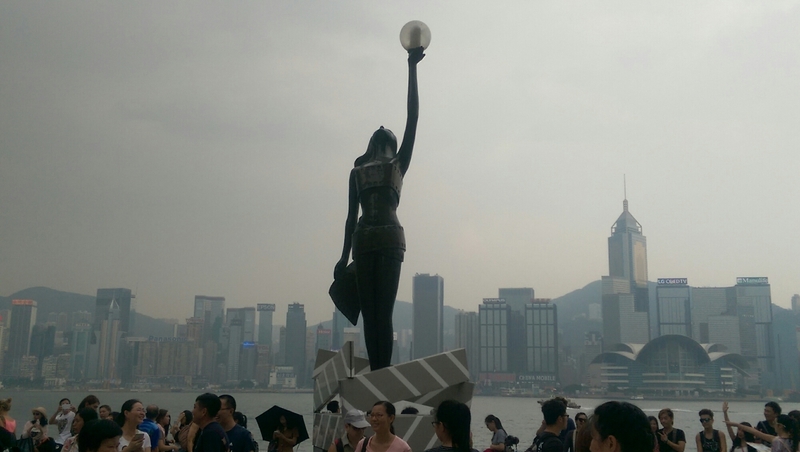 Internet kick me if I’m out of line here, but 5 days in Hong Kong is far too long as a tourist. 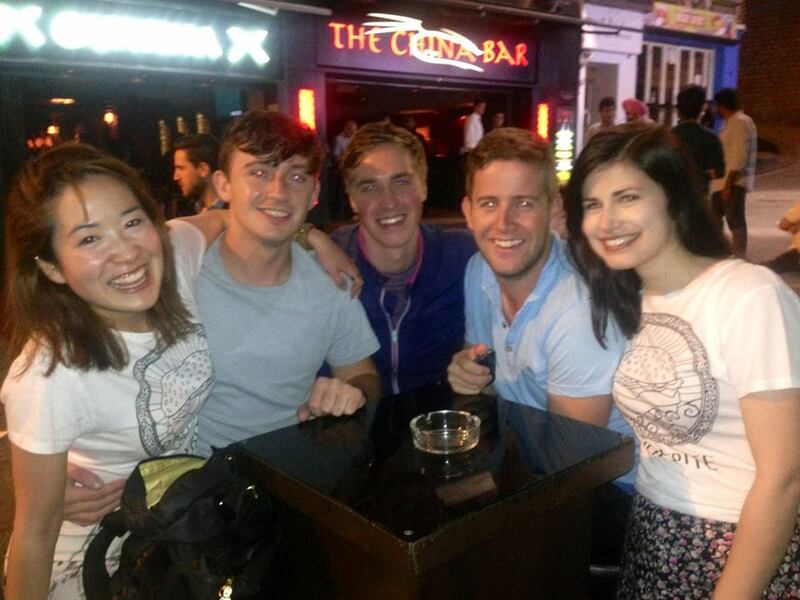 I had great fun in Hong Kong, but admittedly by the 4th day I was struggling to come up with exciting things to do. I scoured countless “Things to do/eat/see” lists on Google and hoping to find a new suggestions (which is equivalent to checking your fridge multiple times, hoping a carrot cake will magically appear in your absence). 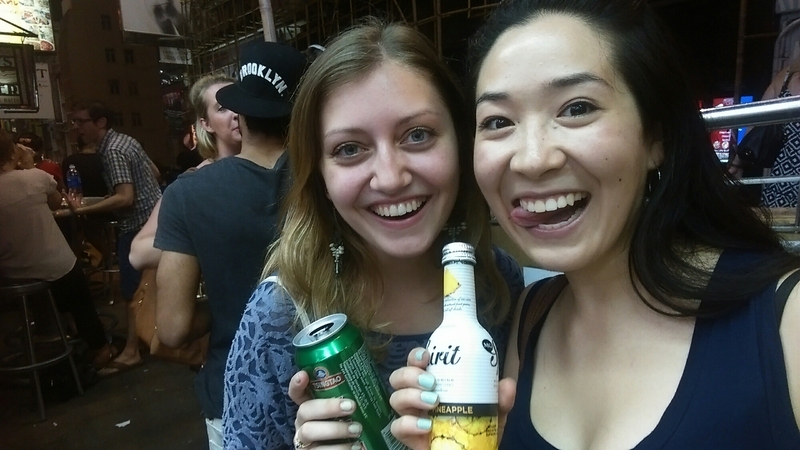 However, I managed to get through just about everything short of marrying a Hong Konger. Including eating BBQ goose at the airport, thus rendering me an invisible Internet award that says “This fair lady successfully ate all the foods proclaimed as “Must Eats” by various articles and random bloggers in the land of Hong Kong”. 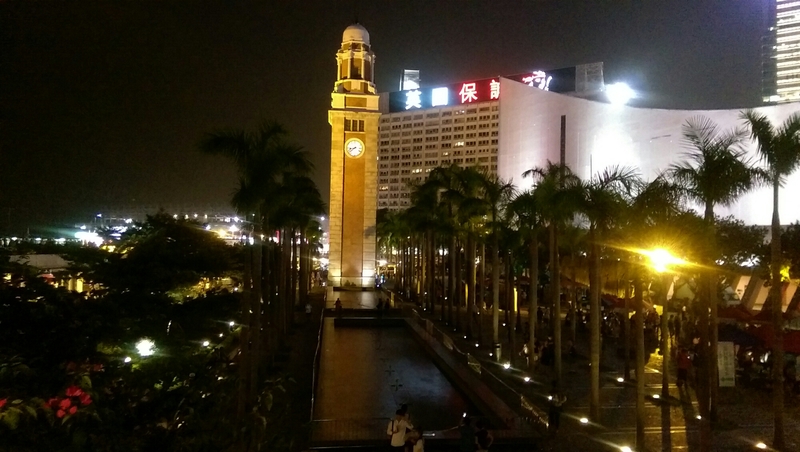 Arriving in the late afternoon with only a short time before I had to meet my friends, I began to explore my new ‘hood of Tsim Sha Shui (TSS). 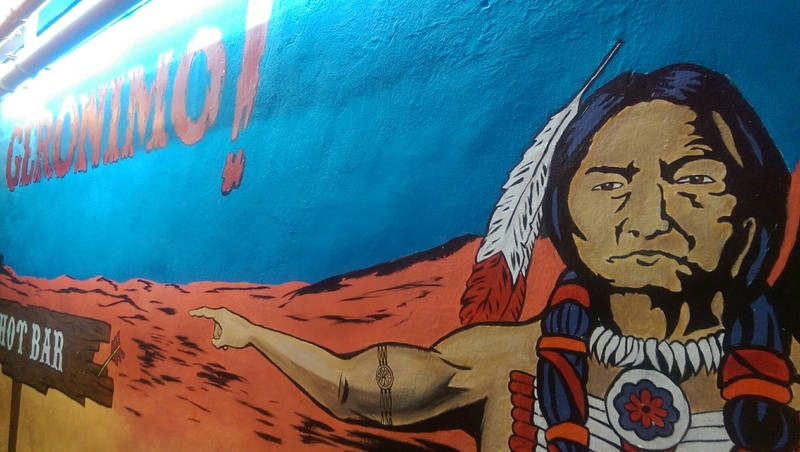 Anyone who has been to TSS will have a story to tell. Namely because TSS is notorious for being a bit of a rough neighbourhood to say the least. I will elaborate further in a later entry at my comfortable stay at the Chung King Mansions– with “comfortable” used completely ironically to indicate “I think I might be stabbed at any second”. Evidently, I survived- just so I could write this guide. Walking up the main boulevard in TSS is a “Frogger” style experience of dodging people selling everything from hostels to cookies. 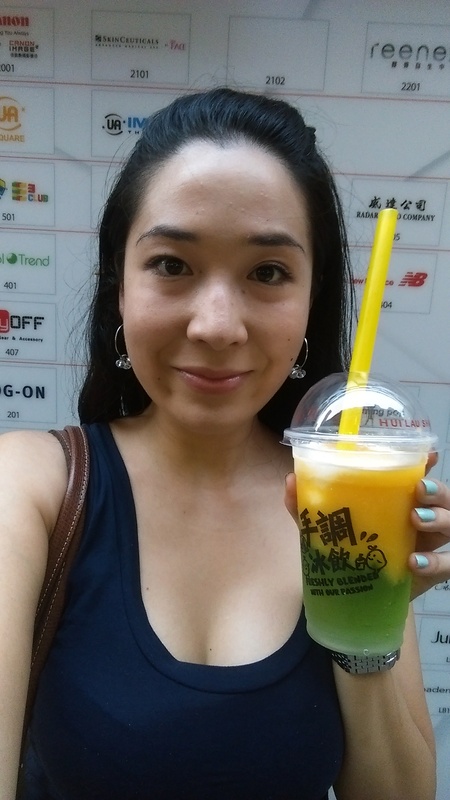 I was feeling a bit exhausted and a bit taken aback by the conditions of my hostel that I decided to treat myself to a drink from Hui Lau Shan– a drinks and dessert shop which celebrates the best fruit in the world- mangoes. 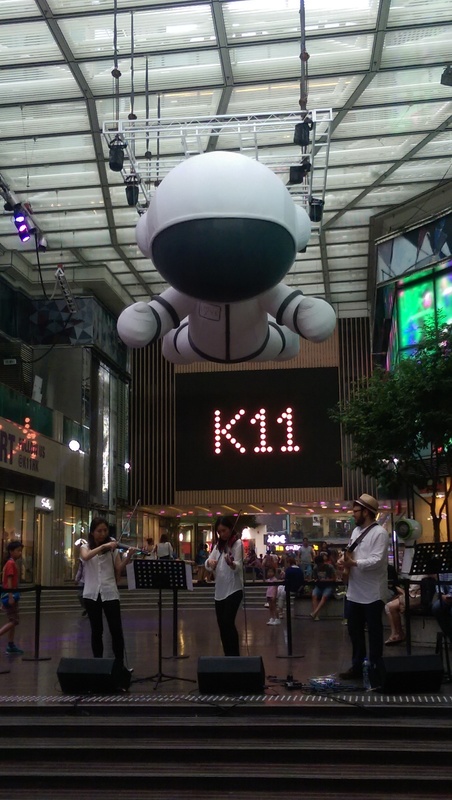 With my delicious Mango, Cream and Aloe Jelly frozen smoothie in hand ($38HK), I stumbled across the wonderful K11 mall. 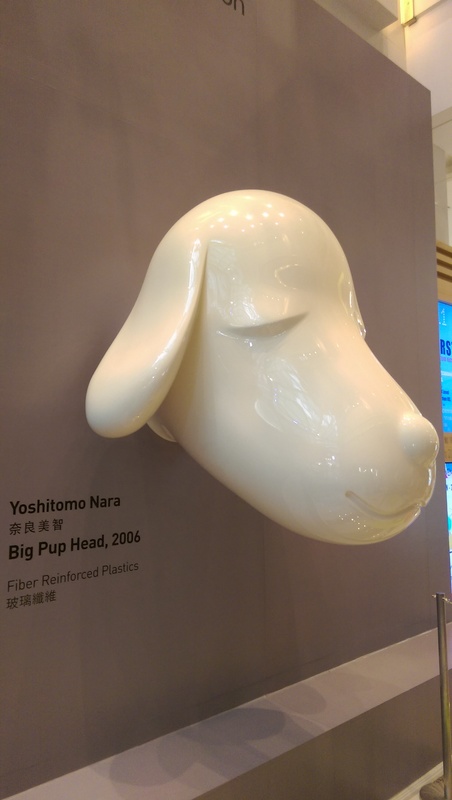 It is touted as the world’s first “art mall”, integrating the elements of art, people, and nature, with the aim to match New York City’s Soho. I would later come back to properly explore the cool design and fashion shops, and art pieces displayed around every bend. 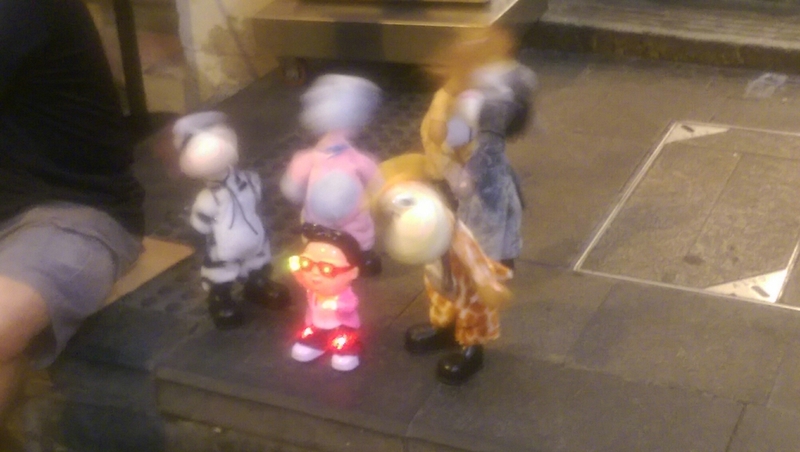 There happened to be a jazz performance outside, which was a welcome respite from the commotion on the street! 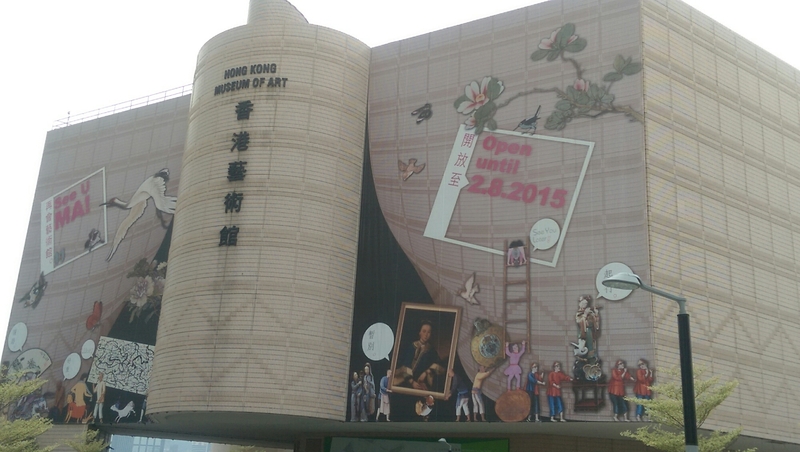 I was sad to find the Museum of Art closed indefinitely for a makeover, so strolling around K11 provided a quick fix for the art junkie in me. 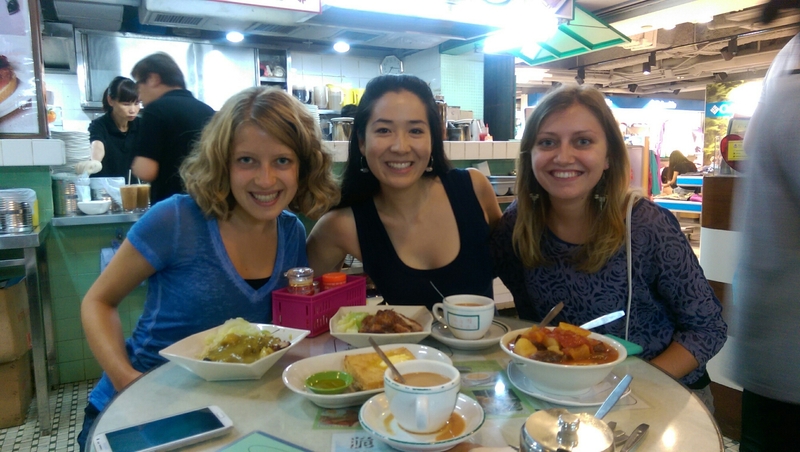 My first dinner was a typical Hong Kong style meal featuring HK’s beloved instant noodles. Instant noodles usually conjures up flashbacks of post-clubbing meals or university days, but in Hong Kong it is standard fare fit for breakfast, lunch and dinner. 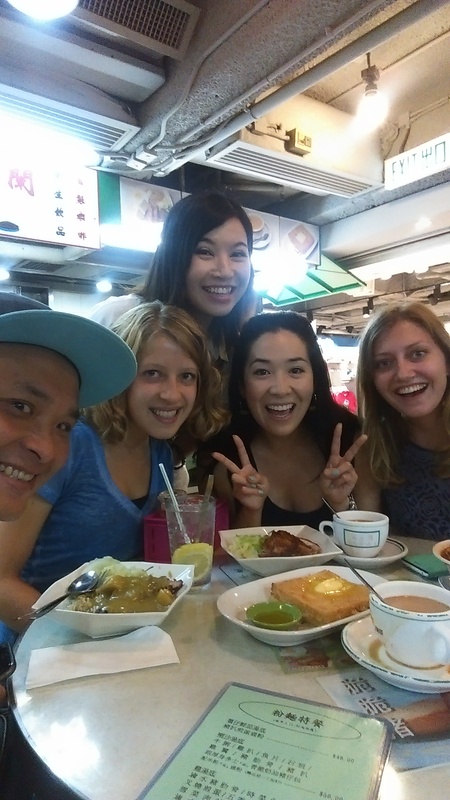 Two lovely friends of friends, Manny and Roy, kindly offered to be our guides for part of our Hong Kong trip, and took us to a popular restaurant, Lan Fong Yuan. 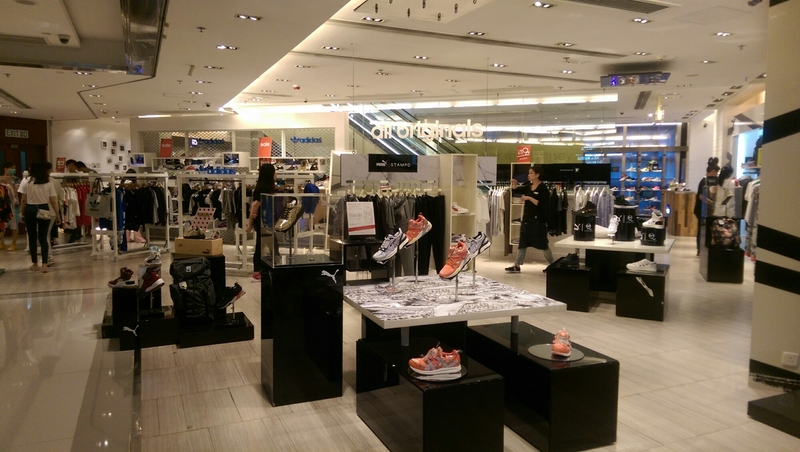 There are various locations, but the one we went to was hidden away in a sports shoe underground mall in TSS. 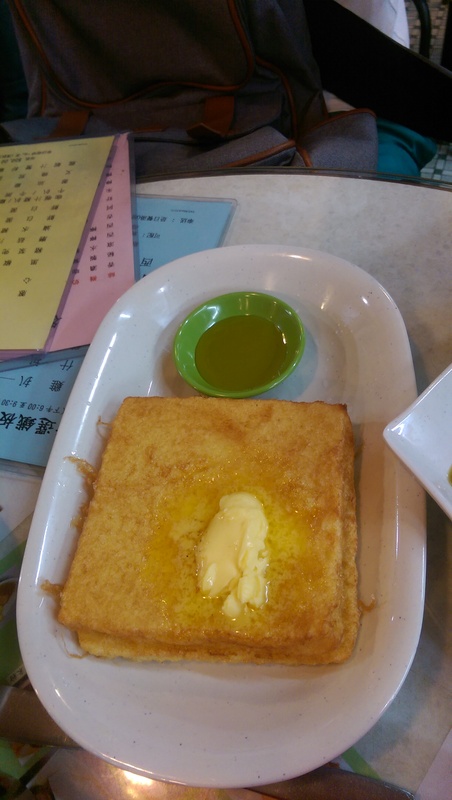 Lan Fong Yuan is a place you go for an “old school” HK diner vibe where you easily order a variety of HK style dishes in one hit. 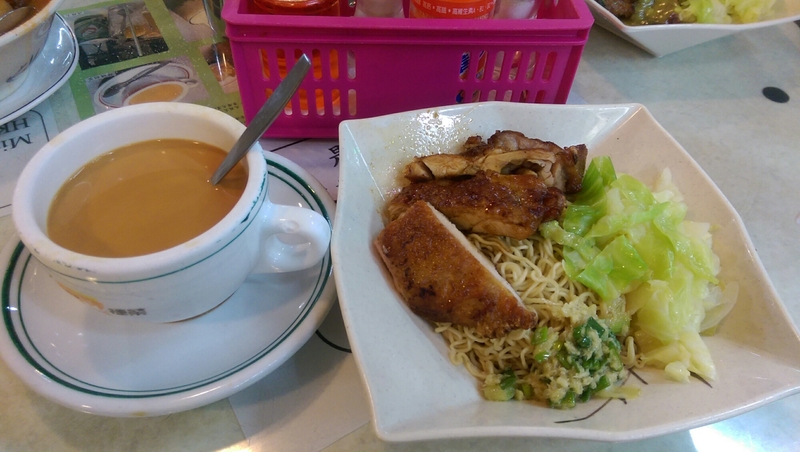 I ordered a pork chop and instant noodles with HK style milk tea set 雞扒撈丁($50). I must admit it wasn’t anything too memorable, but it was still quite nice. Lan Fong Yuan is a good choice for those wanting a standard meal in the middle of TSS that’s affordable and filling. With numerous $50 sets to chose from, you’re sure to find something that takes your fancy. My recommendation would be the macaroni with egg, tomatoes and pork (pictured above). 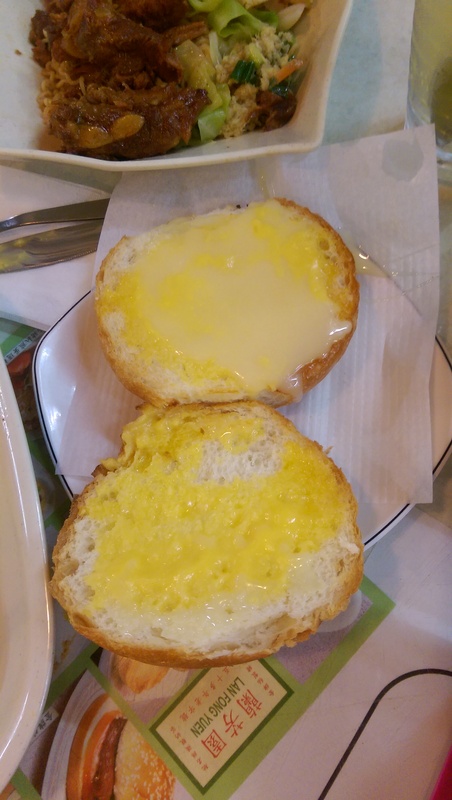 The butter toast with coconut syrup, and condensed milk bun 奶油豬仔包 were also sweet treats I’d recommend trying to accompany your meal. Obviously you can see from the dousing of butter they are both super healthy like a chia and kale bio-orangic muffin – I’m sure even Gweneth Paltro approves. Afterwards we strolled down a couple of minutes to catch the Symphony of Lights on the Avenue of Stars. Unashamedly touristy and a wee bit tacky, it’s worth seeing because it’s a bit of fun and all the same, quite impressive light show. 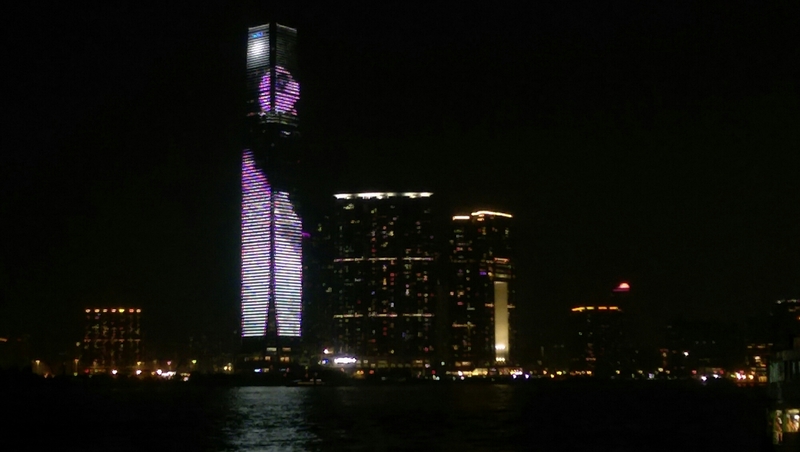 Apparently it’s the ‘World’s Largest Permanent Light and Sound Show’! 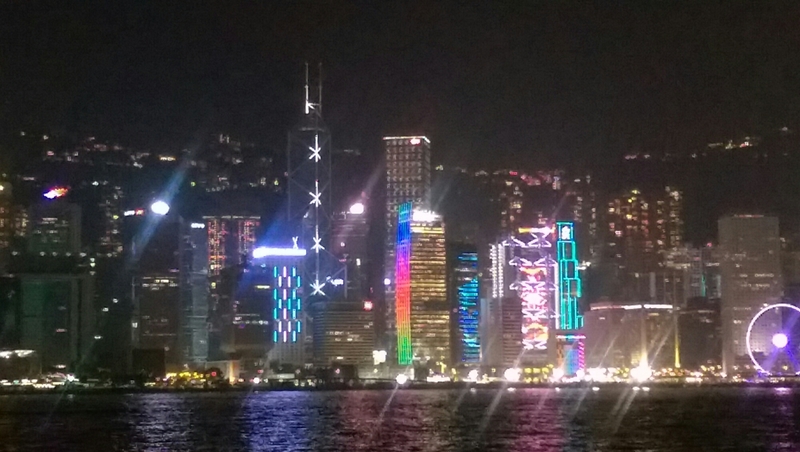 It features coloured lights, laser beams and searchlights projected on and from more than 40 buildings on both sides of Hong Kong’s harbour. Make sure to stroll away from the crowds in order to get some impressive photos with the backdrop of the lit-up buildings. You can also check out the very old clock tower. 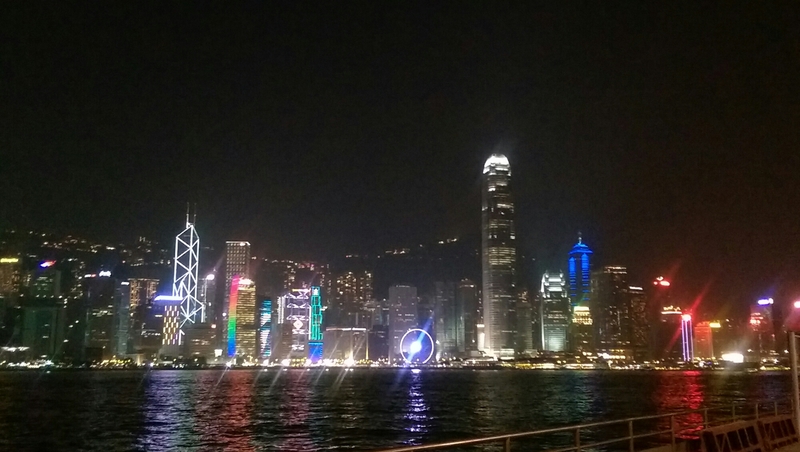 We then took the pleasant, and super cheap ferry ride to the other side of the harbour. 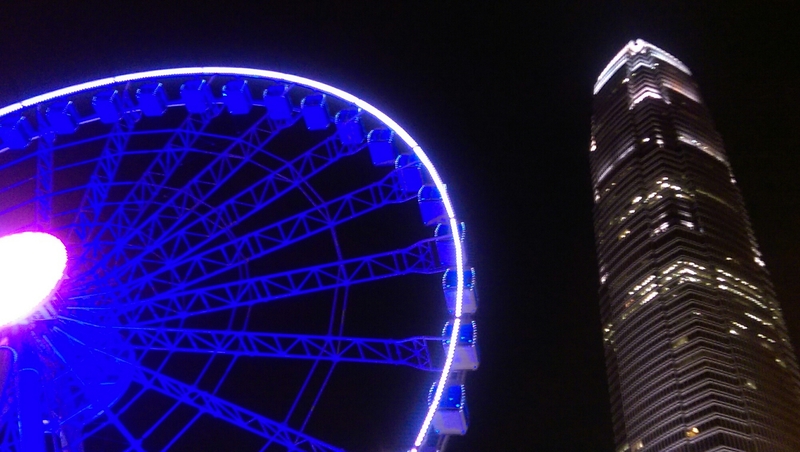 Here, you can even ride a giant ferry wheel if it takes your fancy. 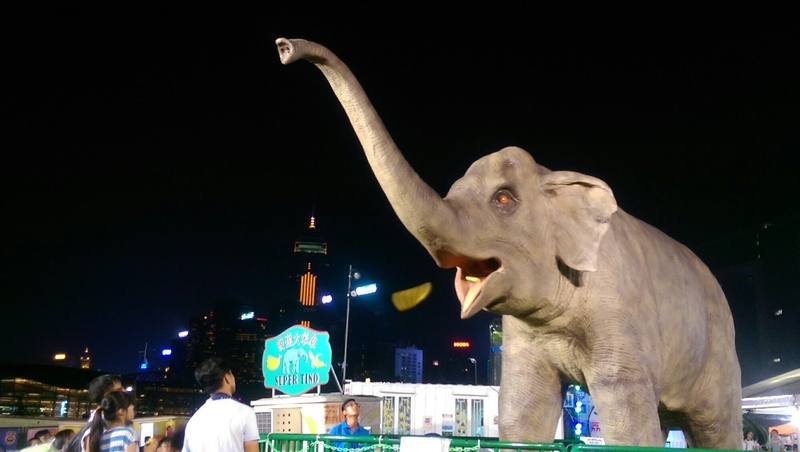 We briefly checked out the rather bizarre permanent circus with an amusing mechanical life-size elephant you throw fake bananas at, and other odd games like “win packets of cheap gum for more than you’d usually pay”. And no, I didn’t try my luck playing, namely because I couldn’t live down if I spent my life savings trying to get a single packet of gum because the game (inevitably) outsmarted me. 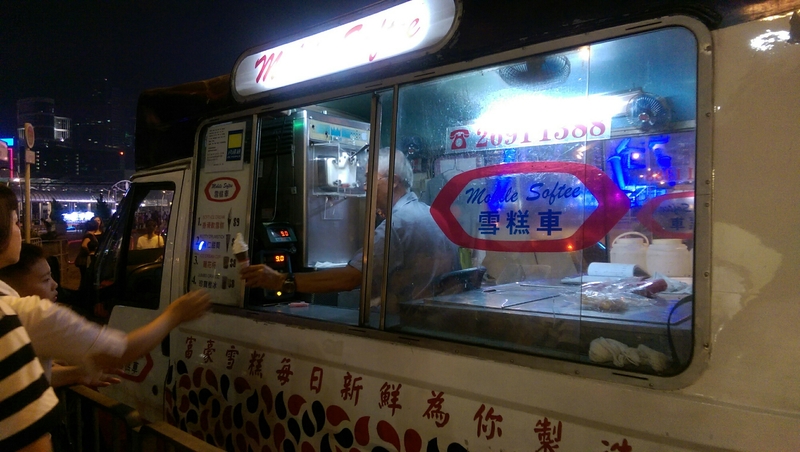 To recover from all the eating we had already done, we were in due need to treat ourselves to a delicious icecream from Mobile Softee. Hearing the icecream song sweetly cooing from the icecream truck, the anticipation rendered me more excited than the comparatively few kids lining up amongst the board of adults. 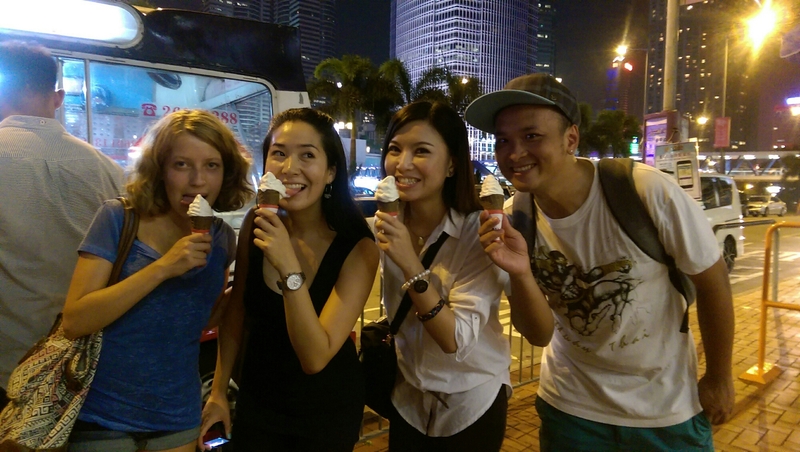 This fleet of icecream trucks are an institution in HK, and for only $8HK a pop, it’s a nostalgic, refreshing treat on a sticky Hong Kong night. 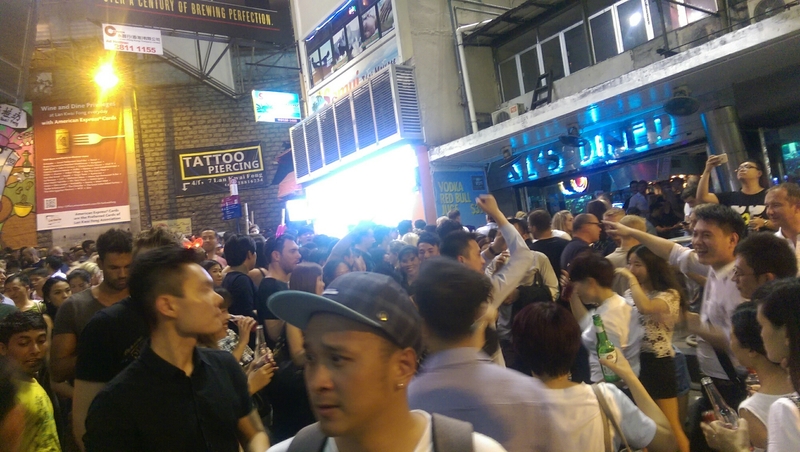 Especially when you’re about to head into the hot mess which is Lan Kwai Fong (LKF). 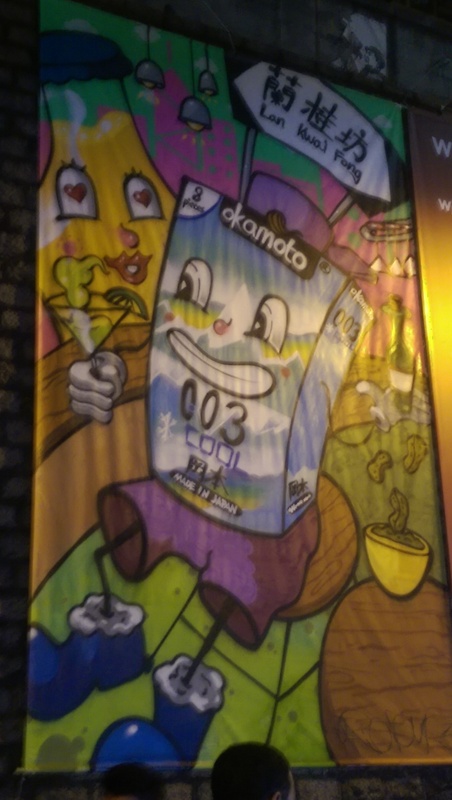 If alleyways packed to the walls with generally jolly people drinking 7/11 beers, and bars spilling out with people does not sound like an idea of a good time, LKF will be your literal nightmare. 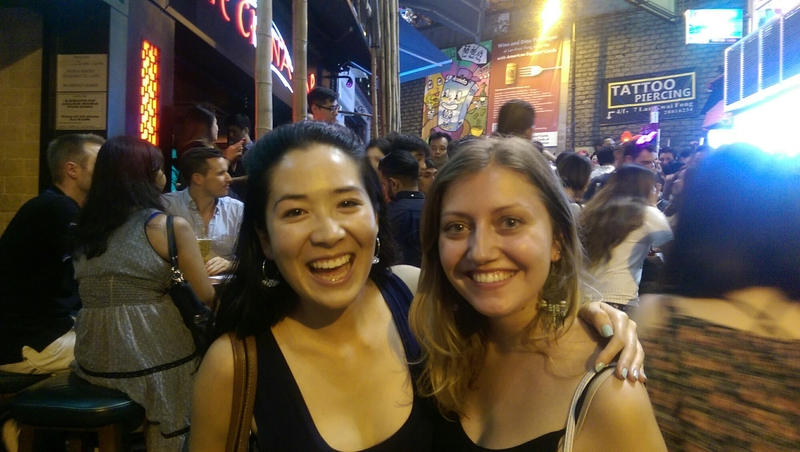 That encapsulates the very thing I love about LKF- it’s a jovial, communal, anything-goes type of atmosphere, inevitably leading you to meet a bunch of new friends by the end of the night. 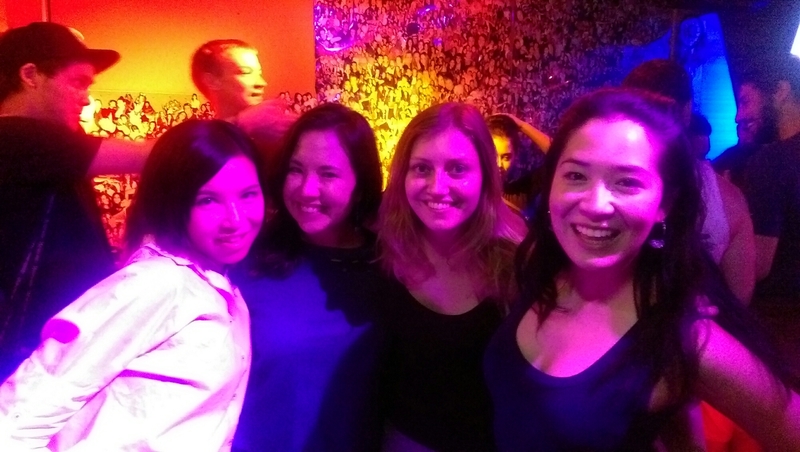 Most people start off grabbing a drink from the 7/11’s to chill with on the street, then head to a bar to dance, or gracefully sip another drink or ten. Things only start really happening at around midnight, but even if you head there around 10 it will still be fun, albeit a more laid back affair. I’ve now been on a Saturday, Sunday, Monday and Wednesday, so can assure you that whatever day you come on, you will be greeted warmly by the sweet embrace of LKF. 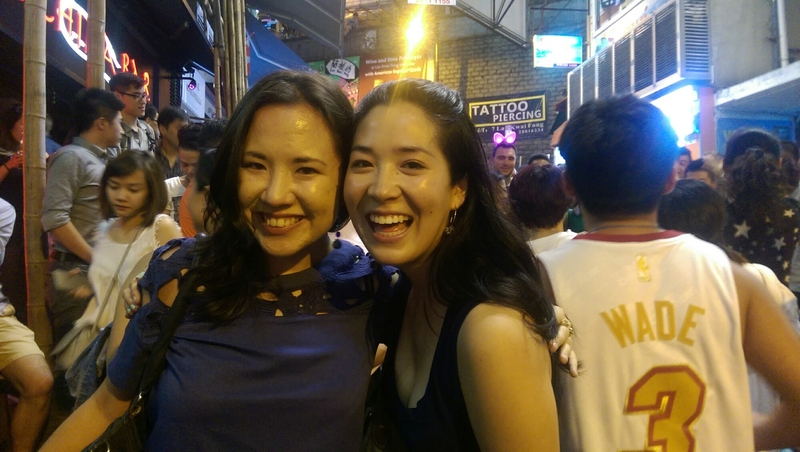 On this particular night we grabbed some drinks from 7/11, walked the alley ways, had a bit of a dance in Gurkha, and some shots and a bit more of a dance in Jeronimo. 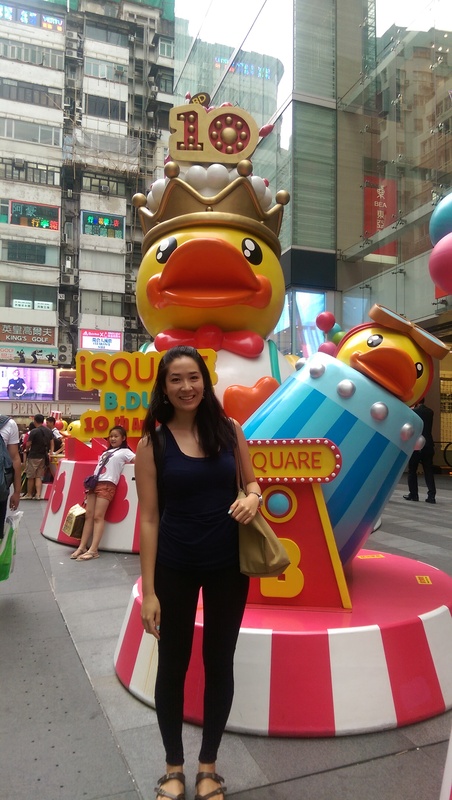 It was a bit of a nostalgic experience, as the first time I went to Hong Kong, my travel buddy Caitlin and I had the greatest fun in LKF. 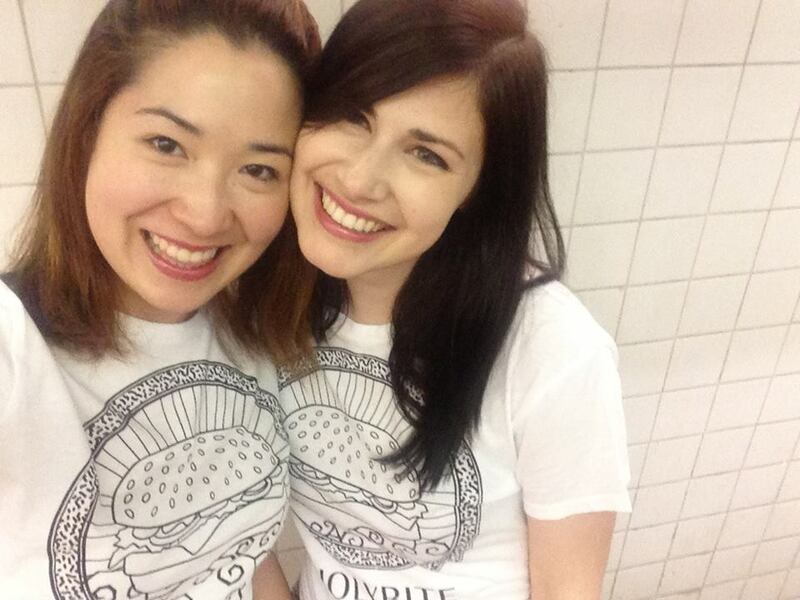 We even wore matching T-shirts which said “Holy Burger”, because, well, we really like burgers and thought everyone should know. 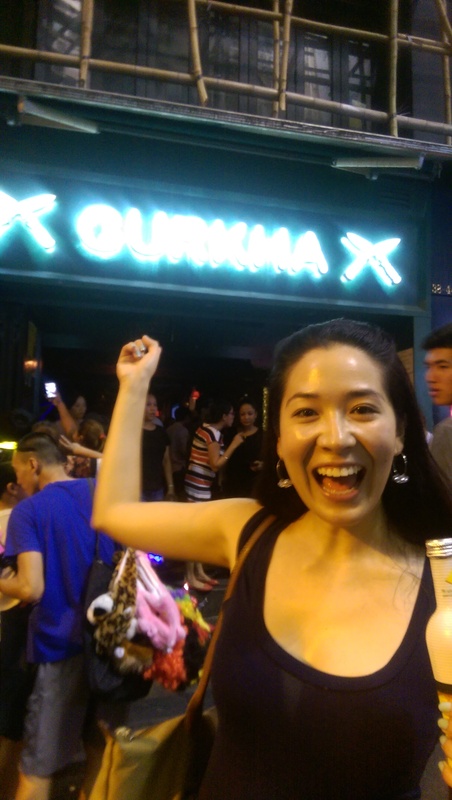 We loved LKF so much so that we went back again the morning before we had to catch our flight back to Japan- trading sleep for a twirl to Danza Kuduro. 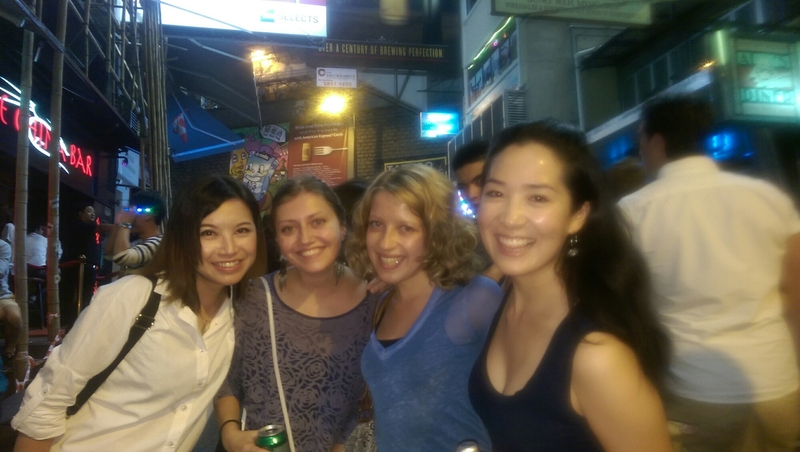 We met people from all over the world, and still keep in contact with some. A year and a half later, it’s still the same amazing, hot mess it was, and that’s the way we all like it. I wonder at what age I will think it’s all too much? Hopefully not any time soon! Our first night in Hong Kong this time around, we went to bed dreaming of our brunch awaiting us the next day at Tim Ho Wan– God of Yum Cha. Alright, that was Day 1, I’ll try to get on to Day 2 as soon as I can! I heard stories about the infamous Chung King mansions ! 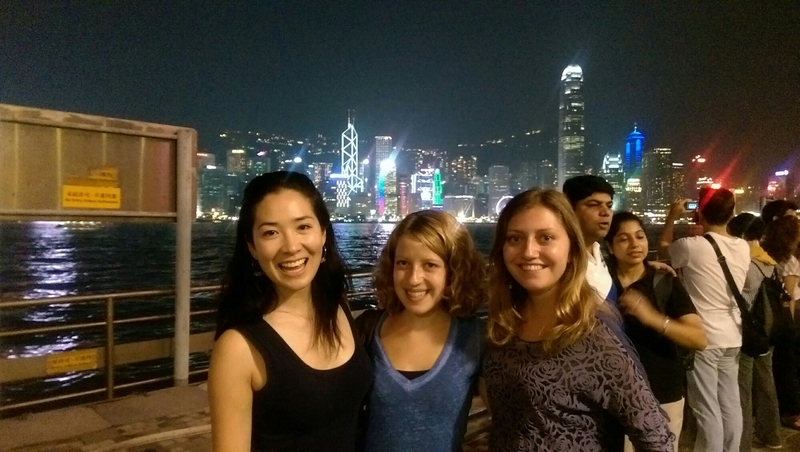 But ultimately didn’t have the guts to stay there and chickened out and stayed on HK island. Long time no “see”. How are you going? Hahaha I am planning to dedicate a whole entry to my stay. Tbh I didn’t know my hostel was situated there before I booked, so I’d probably have second thoughts too had I known! 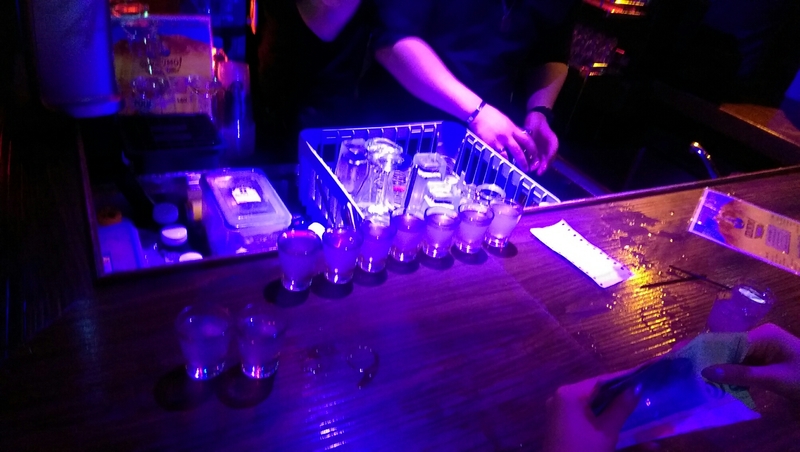 LKF is so much fun eh! I’m glad you agree. I feel a bit seedy for loving it so much, but it really is wonderful I think haha! Yes the 7/11 is great- those workers surely deserve some type of recognition for their hard work!! aha ah well at least it was an experience ! ah shoulda coulda woulda ! Didn’t think many people would want to meet up with a 19yo bogan aha. Haha my friends always joke how bogan I am, so I think you’ll be in similar company! It was especially funny they said this after I lived in Japan!